A mechanical seal is a component which helps join mechanisms together by preventing leakage, containing pressure, or excluding contamination. A mechanical seal consists of a stationary element, a rotating element, and a spring to supply force to hold the two elements together. Mechanical seals are utilized predominantly in pump applications, and are available in a number of head and seat configurations. A mechanical seal contains a primary sealing surfaces, a secondary sealing surface, a means of actuation and a means of drive. Mechanical seals can be divided into either dynamic or stationary categories. Dynamic mechanical seals will employ a secondary dynamic seal (o-ring) which moves axially with the primary seal face. 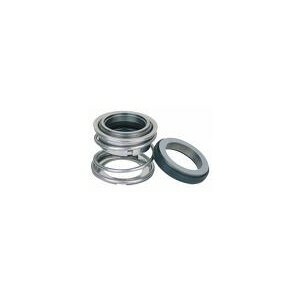 Stationary mechanical seals will employ a static secondary seal (o-ring, packing, or bellows). Mechanical seals come in numerous classifications and materials and are considerably more complex than standard oil seals. Please contact a Bearing Service representative to assist in identifying the right mechanical seal for your application.